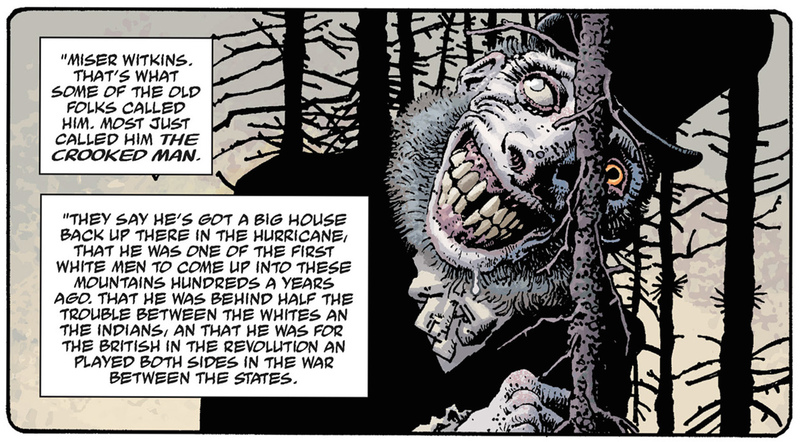 After a month full of articles focusing on cinema, I thought it about time to switch gears and write about my favourite horror comic. Hellboy, created by Mike Mignola in 1994, is without a doubt one of the best modern American comics. Full of pulpy action, complex characters, classic gothic horror and a dose of Lovecraftian science fiction, this bizarre and utterly compelling comic is one of the great comics success stories of the last 50 years. 20 years later, Hellboy is still as compelling as ever, and so I thought it only fit to put together my Top 10 Hellboy stories for the month of October. Enjoy! The second long-form story starring Hellboy could also be considered the real starting point of the Hellboy mythos. It introduces not only the main Nazi villains of the franchise, Karl Kroenen, Ilsa Haupstein and Leopold Kurtz, but also one of the most important of Hellboy villains, the goddess Hecate. In addition to this it expands Hellboy’s origins beyond the basic mythology set up in Seed of Destruction. In addition to all of this mythology work, Wake the Devil also functions as a really good one-off story. There are so many great elements here – Rasputin’s chat with Hellboy in the forests, the introduction of Roger, Hellboy’s long chat with Giurescu’s father – it’s the first long-form story to show the potential that the longer Hellboy stories had. The spiritual successor to “The Third Wish” (2002), “The Island” is a confusing, foreboding, and disturbing story. You can see, reading it, why it took Mike Mignola five years to complete it and why it was the cause of so much strife in his own life. The story basically lays out the secret history of Hellboy’s universe, revealing the origins of God, angels, Earth, the Ogdru Jahad, and exactly what Hellboy’s Right Hand of Doom is. 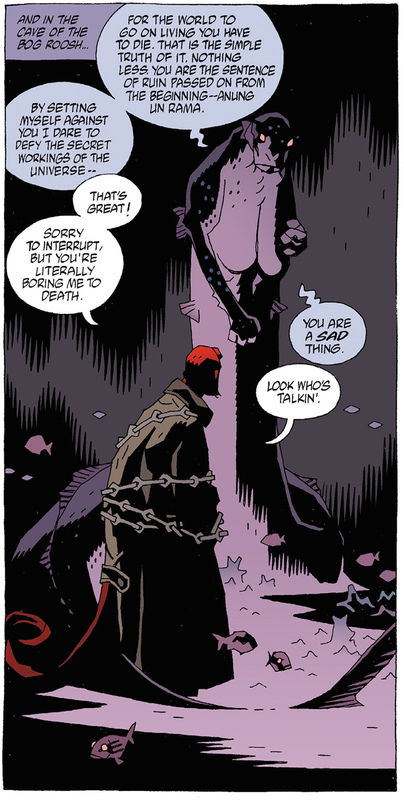 It has an atmosphere of dread that few other Hellboy stories have, and because of this it is singularly nihilistic. It’s a story completely devoid of any kind of hope, and in this respect it is perhaps the most Lovecraftian of all Hellboy stories. Utterly bizarre and unique among the stories of the Hellboy mythos. In perhaps what is one of the most pop-culture enthused stories that Mignola has written, “Hellboy in Mexico” is at its core a tragedy. Hellboy relates to Abe Sapien some events that occurred in 1956 in Mexico. There we see that Hellboy has been sent to Mexico by the B.P.R.D. to deal with an outbreak in supernatural occurrences. There, he meets three luchador brothers who have been sent by the Virgin Mary to eradicate all monsters. Hellboy becomes very close friends with the youngest, but tragedy is just around the corner. Inspired by the cult-favourite luchador films, on its surface “Hellboy in Mexico” sounds like a comedic story that you can’t take too seriously. Luchadors fighthing monsters – awesome! But it is actually perhaps one of the saddest of all Hellboy stories, made all the more memorable by the grotesque artwork of Richard Corben, whom Mignola would write several Hellboy stories for. Poignant and tragic, “Hellboy in Mexico” has everything you could ask of a Hellboy short story. 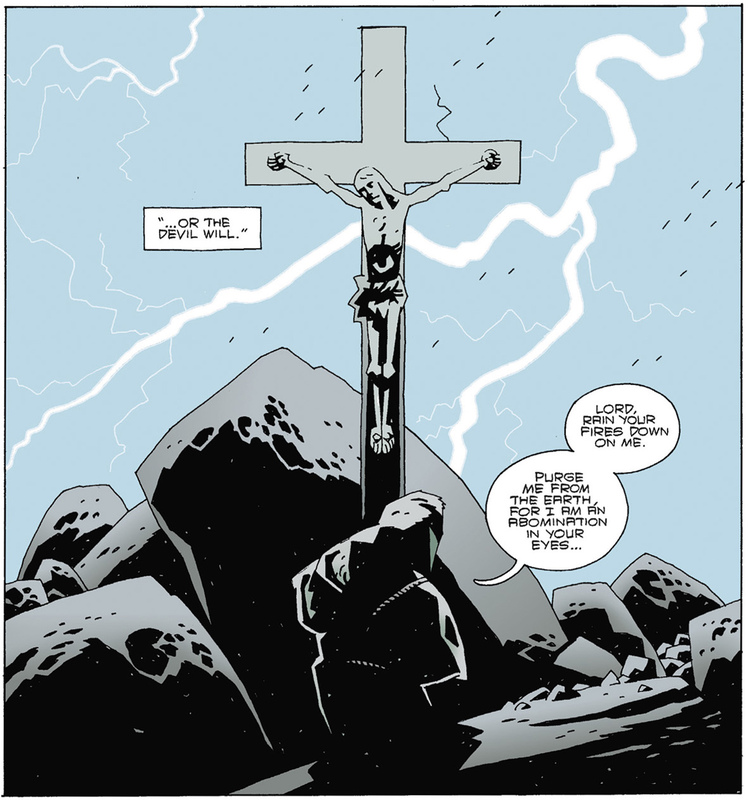 “The Wolves of Saint August” is the second Hellboy story that Mike Mignola worked on and the first that he fully scripted. His artwork is still in it’s more detailed early stages, and the story here really benefits from this style of artwork. It is perhaps the most singularly gothic of all Hellboy stories. 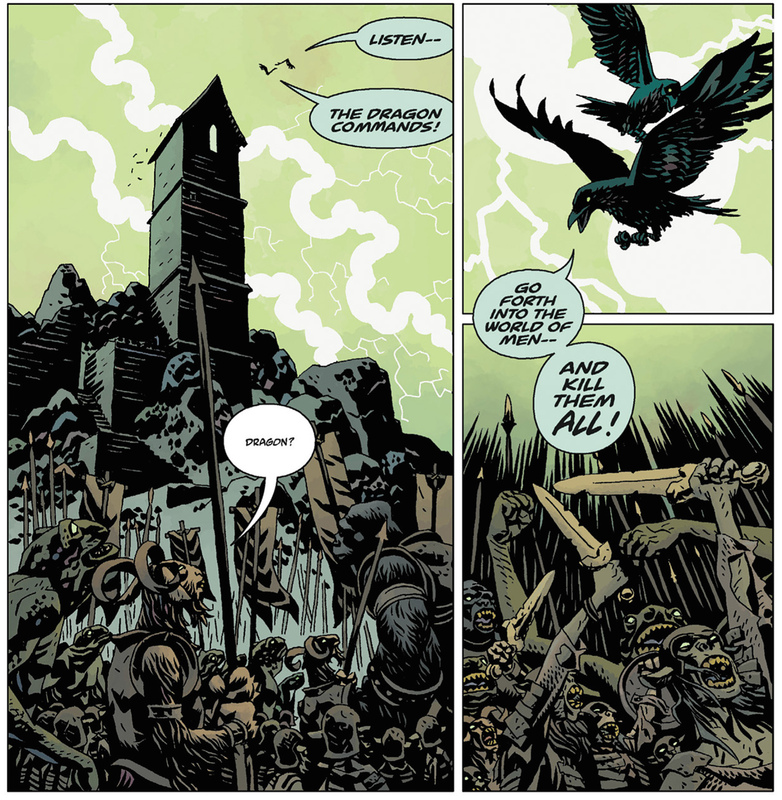 Hellboy and Kate Corrigan visit the town of Griart. What they find is true horror as every single person has been killed by a wild animal. They soon learn the dark, secret history of Griart, involving the ghosts of several werewolves. 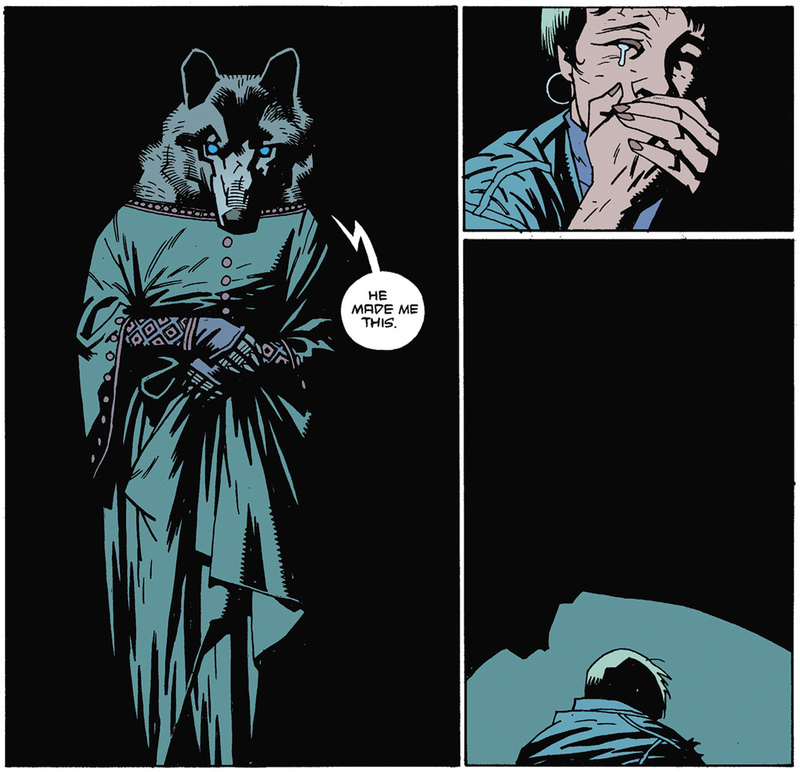 “The Wolves of Saint August” is a rougher, edgier story that is less refined that Mignola’s later works. But it has a savagery, darkness, and classic gothic that is unique among the Hellboy pantheon. This is the first Hellboy story I read that I truly, truly loved. Brilliant. Anyone who’s read my article on the Top 10 American Folk Horror Stories will know that this fantastic story would have to come along eventually. It’s the best story that Mignola has done with Richard Corben because it is so suited to Corben’s own sensibilities as an artist. 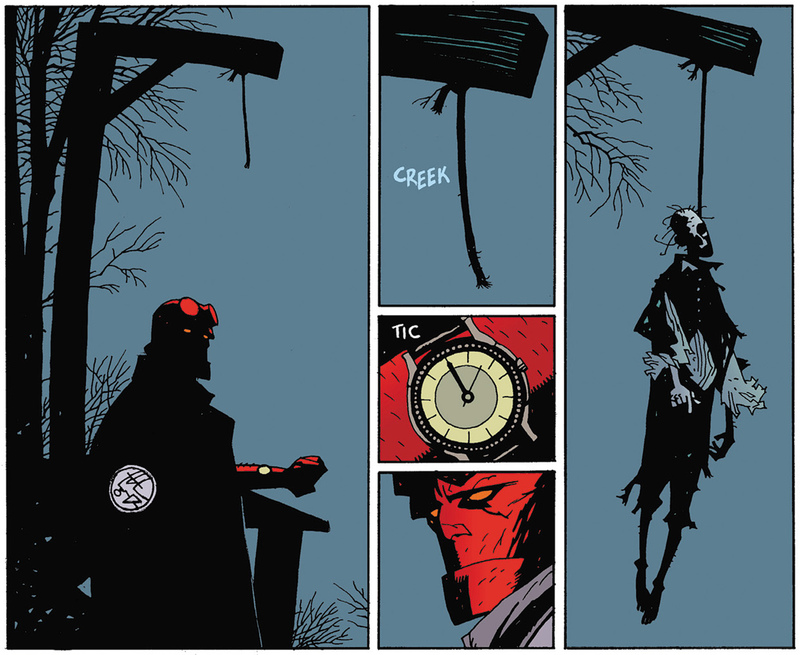 In 1958 Hellboy visits the Appalachian Mountains of Virginia, where he meets Tom Ferrell, a man who in his youth had congress with a witch and now owes his soul to the horrifying Crooked Man, one of Mignola’s truly most terrifying villains and an embodiment of pure evil. The story is made all the more spooky by its setting in a backwards, forested America, and experiments with a type of horror that is rare to see in the pages of Hellboy. If you’re a fan of films like The Evil Dead (1981), you will find much to love here. “Almost Colossus” is a follow up to the second long-form Hellboy story, Wake the Devil, and continues the narrative thread in which Liz Sherman found and revived a homunculus. That homunculus is the focus of the story, as he traverses Europe seeking an end to his own life of misery. He eventually finds his “brother,” created by the same guy who created the homunculus, who promises to take him into his fold. Meanwhile, Hellboy and Kate Corrigan discover that Liz is actually dying as her power was used to revive the homunculus, and they search for him to restore Liz’s power. The homunculus, who henceforth would be known as Roger, is one of Mike Mignola’s most complex and fascinating characters. This first story to feature him is a truly excellent debut, as Hellboy is initially set against Roger. Intriguing and thought-provoking stuff, with a shade or two of Mary Shelley’s Frankenstein (1818) thrown in for good measure. Most Hellboy fans agree that this is the very best Hellboy short story, if not story period. 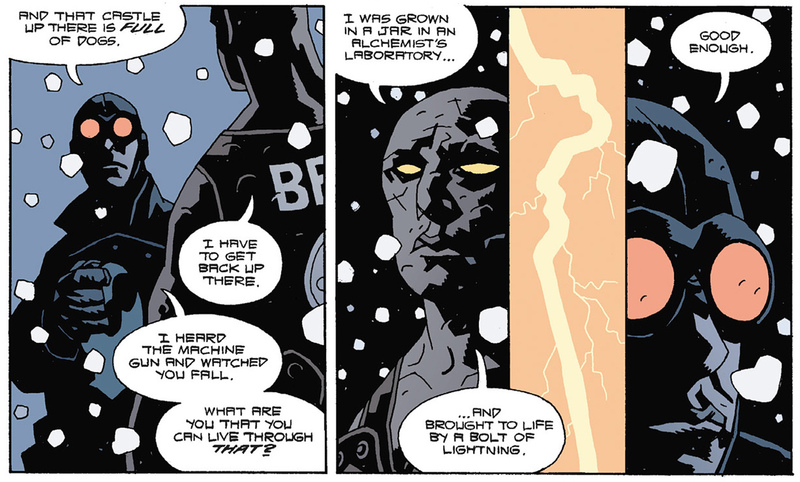 I cannot agree more that it is the strongest short story Mignola has created. Constantly changing, twisting, and surprising, the story finds Hellboy in Ireland in 1958, searching for a missing child. To get the child back to her parents, Hellboy must find a final burial space for body of a man who was a good friend to the faries. 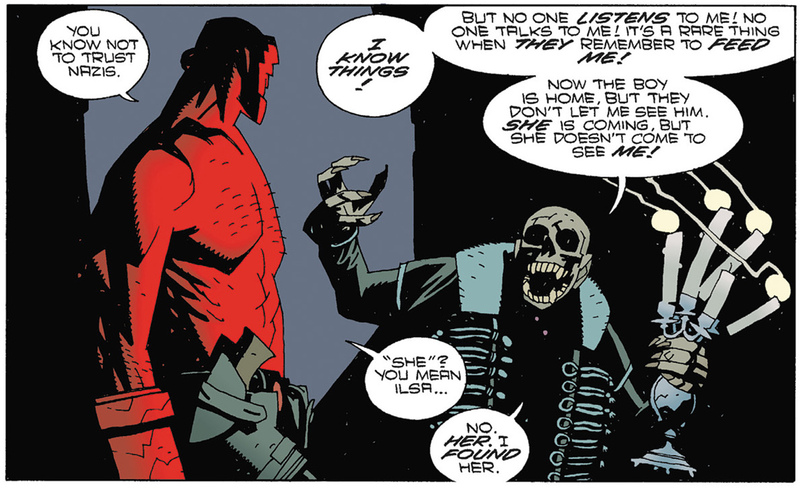 Weird, gothic, and full of humour, humanity, and horror, “The Corpse” is one of the finest moments in the Hellboy universe. Not only is at an excellent standalone story, but it also introduced several characters such as Alice Monaghan, Gruagach, and King Dagda of the Faries who would become incredibly important in later stories. Another very strong contender for greatest Hellboy story, Conqueror Worm sees Hellboy and Roger deployed in Austria to confront the Herman von Klempt. Klempt is awaiting the return of a Nazi rocket sent during the initiation of a Nazi space program in 1939. The B.P.R.D. have confirmed that it is re-entering the atmosphere, but no one can predict what it carries inside of it, sent by the Ogdru Jahad to initiate the end of the world. Featuring perhaps one of the great monsters of the comic-book form, Conqueror Worm is an absolutely riveting story, one full of emotion as Hellboy and Roger fight to save the world. 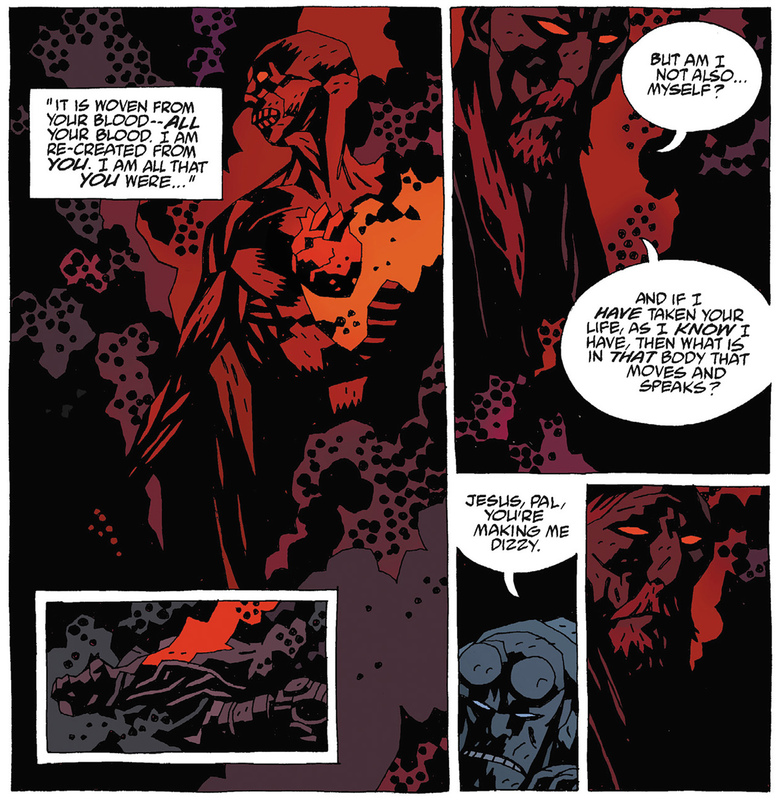 Conqueror Worm remains as one of the most important of Hellboy stories, having major lasting impact upon both the character and its world. It also ranks as one of the finest stories featuring Roger the homunculus. Alright, so it might be cheating to include three stories as my number one pick for the Top 10 Hellboy Stories, but the three really do form a trilogy that acts as the closing of what is now being known as the first half of the Hellboy saga. Most people would balk at the thought of anyone but Mignola illustrating perhaps the most pivotal of Hellboy stories, but newcomer Ducan Fegredo is just as good an artist, and if anything I think these epic stories benefit from his more detailed, but not totally dissimilar style. Everything since Hellboy’s initial appearance in 1994 has been leading up to this: the Ogdru Jahad, Gruagach’s revenge, Hellboy’s ongoing feud with the Baba Yaga; it’s all been leading to these three stories as Hellboy must finally face his destiny as the Beast of the Apocalypse. The trilogy also doubles as perhaps the greatest modern fantasy epic, perfect for those who love The Lord of the Rings or A Wizard of Earthsea, only with a slightly more gothic tone. The story also benefits from being stretched out over three parts, as Hellboy and his true love Alice Monaghan become more deeply portrayed. A comic that will fill you with all emotions, This trilogy is the most heart-stirring of all the Hellboy stories. It is without a doubt Mike Mignola’s greatest artistic achievement, and his magnum opus. For those who have read and enjoyed the Hellboy series, I hope you’ve enjoyed this Top 10. For those who have never read Hellboy before, I hope this Top 10 has given you some hints at some great places to start! Many thanks for reading, and I’ll see you next on Halloween to reveal my personal Top 10 Horror Films of all Time!!! See you then!